An overview and guide for Arena of Valor's Butterfly, Death's Whisper. Butterfly is an assassin character who relies on her skills for bursts of damage. Butterfly is an assassin whose low cooldown, high damage skills and exceptional attack damage allow her to quickly burst down her opponents. Her ultimate, Backstab, closes the distance between her and her prey, making her a strong choice against marksmen and mages. This is all complimented by her passive, assassin, which refreshes her skills each time she scores a kill, keeping her out and fighting. High Attack and Burst Damage – Boasting a high attack stat, Butterfly is able to deal damage extremely quickly through her attack scaling abilities. Free Abilities with Low Cooldowns – Butterfly has no mana; all of her abilities are free to use. With a bit of attention to her health, she can stay out on the field gaining experience and gold indefinitely. Furthermore, resources won’t be an issue in fights where she is regularly casting her abilities. Health Restore and Skill Refresh on Kills – Butterfly’s Passive, Assassin, refreshes her skills after she participates in a kill. In addition, Backstab heals Butterfly after use or when its target has died, allowing her to stay out and fighting so long as she is regularly getting kills. Virtually No Natural Crowd Control – A highly mobile hero or one possessing crowd control will not have much trouble escaping the assassin. The only thing that Butterfly has to her benefit in regards to crowd control is a slow in Whirlwind. Needs to Sneak Close to Enemies to Jump Them – Without proper planning, it is very easy for an enemy to see Butterfly coming and escape before she can come into range. No Escape Abilities – After you jump into the fight, you are usually in until either you or your opponent are dead. If the enemy gets back up, you have very little in ways to disengage from the fight. You will want to jungle with Butterfly. The extra levels and golem buffs will help greatly in ganking, which you should be doing regularly. Start with Sword Propel, since it allows her to jungle more effectively. It has a higher damage than her first skill and lowers in cooldown with each rank. The first ability offers a bit of control and slow immunity, but neither scale with rank. Stick to jungling and ganking at the beginning of the game. The jungle will get you the early levels you’ll need to dominate low-level heroes. Start roaming between the lanes to gank after hitting level 4, aiming primarily for the enemy’s marksman or mage. As the game moves towards team fights, shift your strategy to assisting teammates. Butterfly is rather fragile, so you should avoid initiating big fights. Instead, try to slip in after things have already started to get your damage in more safely. Solo Fights: Jump in with Backstab, slow the target with Whirlwind, and follow with Sword Propel for an instant burst of damage. If this isn’t enough to take the target down, finish them off with normal attacks and any abilities that come off of cooldown. 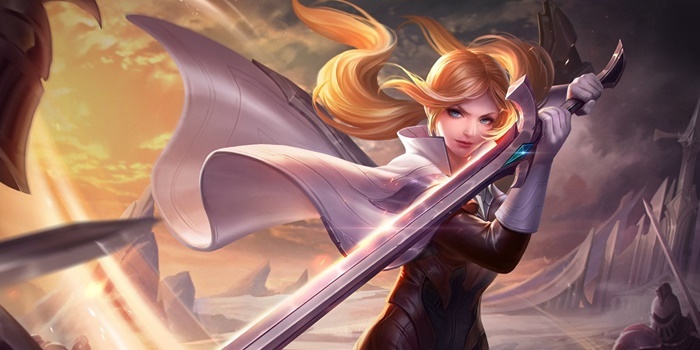 Team Fights: When not under the damage reducing effects of Backstab, Butterfly is rather fragile and will be a prime target to the enemy team if she has been doing well. As such, avoid starting fights yourself. Let your tanks start the fight, sweeping in after things have started heating up to finish low health enemies off. Killing the enemy Marksmen and Support should be your first priority. Whirlwind is Butterfly’s only escape tool, allowing her to shake off any slowing effects and providing her with a small speed boost. Use the boost to slip out of combat and towards safety. Assassin – Passive – Kills and assist will reset the cooldowns of all abilities. This is what keeps you going in team fights. Butterfly relies almost completely on her abilities for damage and so should be using them as often as possible in fights. This ability allows you to be liberal with your skill usage, especially when an enemy is close to death. The passive has no cooldown or limit in its use. Whirlwind – Butterfly swings her blade in a full arc at nearby enemies, dealing (+0.65 AD)ˀ. Immediately removes and becomes immune to movement speed reduction for a short period. Also increases Butterfly’s movement speed by 50% for 1 second. Whirlwind’s damage doesn’t scale as well as Sword Propel and never gets a lower cooldown or higher debuff. As a result, Whirlwind should be a lower priority in leveling than either of Butterfly’s other skills. Using Whirlwind does not interrupt her attack timer; it’s possible for an auto attack and Whirlwind to land at the same time. As such, special attention to Butterfly’s attacks isn’t needed when using the skill. Sword Propel – Butterfly throws her sword, dealing 350/400/450/500/550/600 (+1.25 AD) physical damage to enemies in its path. Also increases her attack speed by 50% for 3 seconds. Sword Propel is a huge help when clearing the jungle and should thereby be taken first. When approaching a Jungle camp, use Sword Propel to begin the fight before fully in range to shave a few seconds off your route. Sword Propel scales in both damage and cooldown time as you level the skill, and thereby should be leveled to max first. The damage offered both in raw physical damage and the attack speed buff make it a clear choice over Whirlwind. Using Sword Propel will interrupt Butterfly’s attack cycle. This means that using Sword Propel when Butterfly would land a basic attack will prevent the basic attack from happening. Therefore, try to use Sword Propel directly after Butterfly lands a basic attack to optimize your DPS. Backstab – Butterfly blinks behind the enemy with lowest HP (prioritizes heroes) and stabs the target, dealing 500/725/950 (+1.35 AD) physical damage, and increasing her damage reduction by 50% (decreases rapidly over time). Also marks the enemy target and reduces the target’s movement speed by 30% by 3 seconds. When the mark expires, Butterfly recovers HP equivalent to 20% of the damage dealt to the target. Backstab is your main way to initiate on a foe, getting you right next to them. It further starts the battle off in your favor with its impressive damage reduction buff. Tapping the ability will target a nearby unit automatically based on the player’s targeting settings. However, attempting to aim with the skill wheel will limit its range to a cone. This can be especially useful when trying to target a specific enemy or when fleeing from a bad fight. Backstab has a rather low cooldown, even at level one. As such, it can be freely used while jungling to make the process much quicker. Since Butterfly’s skills all refresh on a kill, using Backstab on an enemy you have already engaged is also fine. The extra damage and damage reduction can be what was needed to finish off the fight. Backstab should always be the first ability you use. The damage reduction will help Butterfly start the fight strong and the damage from her other abilities will add to the healing received from Backstab. Be careful when your health is low – Butterfly can quickly jump in and execute you, even when you’re under a turret. Coordinate with your teammates who have hard crowd control to disable the assassin while she is benefitting from Backstab’s damage reduction. Butterfly’s capability to quickly assassinate enemies can be bolstered by running an offense-heavy Arcana set that includes Onslaught, Assassin, and Skewer. Butterfly’s vulnerability to burst attacks can be lessened by taking Indomitable, Undying and Crusader. Tanks are your primary weakness, their high health and CC being big counters to the timing-focused assassin. Avoid fighting with them unless they have very low HP or your team is moving together to gank. Though more manageable than tanks, Butterfly will not do too well against most warriors. Their higher defenses and competence at close ranges will make a quick kill hard work. Coordinate with your team if you need to put one down. As an assassin herself, fighting with another assassin can go either way. Getting the jump on one and an early lead can mean some quick kills. However, Butterfly’s own mediocre defense will be easy to exploit by an opposing assassin’s burst as well. As such, you will want to wait for a moment when you can burst them down without allowing a chance to retaliate. Wait for a level advantage or a moment of weakness to come up before engaging with another assassin. While more formidable than marksmen or supports, mages have a tough time with Butterfly. If the mage in question relies on control abilities, wait until they’ve been used up before striking. A Butterfly who has been stunned is as good as dead. Marksmen hate Butterfly, she able to get right up in their faces. In addition, her burst damage allows her to quickly shred their low health pools, making them natural targets for the girl. Make them among your focus in team fights, as the enemy team will be severely crippled without their carries. Supports can be trouble, generally possessing control abilities that can lock Butterfly down. Be careful when they are around and don’t engage them until after the main damage dealers have been dispatched.